the Voluntary Partnership Agreement between the European Union and the Republic of Indonesia on forest law enforcement, governance and trade in timber products to the European Union (2) (hereinafter referred to as ‘the Agreement’) entered into force on 1 May 2014. Article 22(3) of the Agreement provides for amendments regarding the Annexes to be adopted by the Joint Implementation Committee. There is a need to update the Annexes I, II, and V to the Agreement in order to reflect changes made after the conclusion of the Agreement in the relevant Indonesian legislation and guidelines concerning the application of the Indonesian Timber Legality Assurance System. Therefore, Annexes I, II, and V to the Agreement should be amended accordingly. Those modifications should be approved on behalf of the European Union. The amendments to Annexes I, II, and V to the Voluntary Partnership Agreement between the European Union and the Republic of Indonesia on Forest Law Enforcement, Governance and Trade in timber products into the European Union are hereby approved on behalf of the European Union. The position to be taken by the Commission, on behalf of the European Union, in the Joint Implementation Committee (JIC) set up by the Voluntary Partnership Agreement between the European Union and the Republic of Indonesia on Forest Law Enforcement, Governance and Trade in timber products into the European Union shall be based on the attached draft decision of the JIC. After adoption of the amendments to Annexes I, II, and V to the Agreement by the JIC, the decision of the JIC shall be published in the Official Journal of the European Union, as well as the date of its entry into force. (1) OJ L 150, 20.5.2014, p. 250. The Agreement provides in Article 22, paragraph 3 that the Joint Implementation Committee may adopt amendments to the Annexes to this Agreement. The Parties have agreed that there is a need to update the Annexes I, II, and V to the agreement in order to reflect changes made after the conclusion of the Agreement in the relevant Indonesian legislation and guidelines concerning the application of the Indonesian Timber Legality Assurance System. The Annexes I, II and V to the Agreement are replaced by amended version as set out in the Annex to this Decision. This Decision shall be drawn up in duplicate in the Bulgarian, Croatian, Czech, Danish, Dutch, English, Estonian, Finnish, French, German, Greek, Hungarian, Italian, Latvian, Lithuanian, Maltese, Polish, Portuguese, Romanian, Slovak, Slovenian, Spanish, Swedish and Indonesian (Bahasa Indonesia) languages, each of these texts being authentic. In case of divergence of interpretation the English text shall prevail. This Decision shall enter into force on …. The list in this Annex refers to the Harmonised Commodity Description and Coding System established by the International Convention on the Harmonised Commodity Description and Coding System of the World Customs Union. Wood in the rough, whether or not stripped of bark or sapwood, or roughly squared. (Prohibited from export under the Indonesian law. In line with Article 3(3) of the VPA, products under this HS code may not be FLEGT licensed and therefore may not be imported into the Union). Hoopwood; split poles; piles, pickets and stakes of wood, pointed but not sawn lengthwise; wooden sticks, roughly trimmed, but not turned, bent or otherwise worked, suitable for the manufacture of walking-sticks, umbrellas, tool handles or the like. (Prohibited from export under the Indonesian law. In line with Article 3(3) of the VPA, products under this HS code may not be FLEGT licensed and therefore may not be imported into the Union). Railway or tramway sleepers (cross-ties) of wood. (Prohibited from export under the Indonesian law. In line with Article 3(3) of the VPA, products under this HS code may not be FLEGT licensed and therefore may not be imported into the Union). Wood sawn or chipped lengthwise, sliced or peeled, planed, sanded or end-jointed, of a thickness exceeding 6 mm. Wood sawn or chipped lengthwise, sliced or peeled, not planed, not sanded or not end-jointed, of a thickness exceeding 6 mm. (Prohibited from export under the Indonesian law. In line with Article 3(3) of the VPA, products under this HS code may not be FLEGT licensed and therefore may not be imported into the Union). Wood (including strips and friezes for parquet flooring, not assembled) continuously shaped (tongued, grooved, rebated, chamfered, V-jointed, beaded, moulded, rounded or the like) along any of its edges, ends or faces, whether or not planed, sanded or end-jointed. Wood marquetry and inlaid wood; caskets and cases for jewellery or cutlery, and similar articles, of wood. Other -- Wood in the form of logs or squared logs with simple process in the surface, carved or finely threaded or painted, does not have significant added-value and no significant change in shape (HS Ex. 4420.90.90.00 in Indonesia) (Prohibited from export under the Indonesian law. In line with Article 3(3) of the VPA, products under this HS code may not be FLEGT licensed and therefore may not be imported into the Union). Other -- Other --- Wood in the form of logs or squared logs with simple process in the surface, carved or finely threaded or painted, does not have significant added-value and no significant change in shape (HS Ex. 4421.90.99.00 in Indonesia) (Prohibited from export under the Indonesian law. In line with Article 3(3) of the VPA, products under this HS code may not be FLEGT licensed and therefore may not be imported into the Union). Chemical wood pulp, soda or sulphate, other than dissolving grades. Note: Paper products originating from non-wooden or recycled material are accompanied by a formal letter from the Indonesian Ministry of Industry validating the use of non-wooden or recycled materials. Such products will not be FLEGT licensed. Wood in the form of logs or squared logs with simple process in the surface, carved or finely threaded or painted, does not have significant added-value and no significant change in shape (HS Ex. 9702.00.00.00 in Indonesia) (Prohibited from export under the Indonesian law. In line with Article 3(3) of the VPA, products under this HS code may not be FLEGT licensed and therefore may not be imported into the Union). Hoopwood; split poles; piles, pickets and stakes of wood, pointed but not sawn lengthwise; wooden sticks, roughly trimmed, but not turned, bent or otherwise worked, suitable for the manufacture of walking-sticks, umbrellas, tool handles or the like. Wood sawn or chipped lengthwise, sliced or peeled, not planed, not sanded or not end-jointed, of a thickness exceeding 6 mm. Other -- Wood in the form of logs or squared logs with simple process in the surface, carved or finely threaded or painted, does not have significant added-value and no significant change in shape (HS Ex. 4420.90.90.00 in Indonesia). Other -- Other --- Wood in the form of logs or squared logs with simple process in the surface, carved or finely threaded or painted, does not have significant added-value and no significant change in shape (HS Ex. 4421.90.99.00 in Indonesia). Wood in the form of logs or squared logs with simple process in the surface, carved or finely threaded or painted, does not have significant added-value and no significant change in shape (HS Ex. 9702.00.00.00 in Indonesia). Indonesian timber is deemed legal when its origin and production process as well as subsequent processing, transport and trade activities are verified as meeting all applicable Indonesian laws and regulations. Indonesia has five legality standards articulated through a series of principles, criteria, indicators and verifiers, all based on the underlying laws, regulations and procedures. These standards can be further divided into sub-standards as described in the TLAS Guidelines. The Indonesian legal framework also includes sustainable forest management standards defined for permit holders operating within production forest zones on state-owned land. All permit holders must comply with the criteria of legality as stipulated in the legality standards. Not later than the date when their first legality certification expires, permit holders operating within production forest zones on state-owned land must comply with both the legality standard and the sustainable forest management standard, as stipulated in the TLAS Guidelines. Indonesia is committed to regularly review and improve the legality standards through a multistakeholder process. — Legality Standard 5: the standard for primary and downstream forest based industries and traders. Forest management unit (concessionaires) is located within the production forest zone. Permit holder can demonstrate that the timber utilisation permit (IUPHHK) is valid. Proof of payment for the timber forest product utilisation permit. Comply with the system and procedures for harvesting. Permit holder possesses a harvest plan for the cutting area that has been approved by the competent administrative authorities. The competent administrative authority has approved the work plan documents: master plan, annual work plan, including their attachments. Map indicating logging exclusion zones within the Annual Work Plan and evidence of implementation on the ground. Harvesting locations (blocks or compartments) on the map are clearly marked and verified on the ground. Timber forest product utilisation master plan document & attachments (on going applications are acceptable). The location and extractable volumes of natural forest logs within areas to be harvested correspond with the work plan. The legality of the transport or the change of ownership of round logs. Permit holders ensure that all the logs transported from a log yard in the forest to a primary forest products industry, or registered log trader, including via an intermediate log yard, is physically identified and accompanied by valid documents. All the timber transported out of the permit areas is accompanied by a valid transport document. The application of the timber administration marks/barcode. Permit holder shows proof of payment of Reforestation Fund and/or Forest Resources Fee, which corresponds to the log production and the applicable tariff. Payment Orders for Reforestation Funds and/or Forest Resources Fee. Proof of Deposit made for the Payment of Reforestation Fund and/or Forest Resources Fee and the Payment Slips. Payment of the Reforestation Funds and/or Forest Resources Fee is consistent with log production and the applicable tariff. Permit holders who ship logs are Registered Inter- Island Timber Traders (PKAPT). The vessel used to transport round logs is Indonesian flagged and possesses a valid permit to operate. Registration documents which show the identity of the vessel and valid permit. Permit holder has an approved applicable environmental impact assessment (EIA) document and has implemented measures identified in it. Permit holder has applicable EIA documents approved by the competent authorities which cover the entire work area. Permit holder has environmental management plan and environmental monitoring plan implementation reports indicating the actions taken to mitigate environmental impacts and provide social benefits. Forest management unit is located within the production forest zone. Business unit in the form of group. The business group is legally established. Deed or proof of establishment. The competent administrative authority has approved the annual work plan document. Approved annual work plan document. Map indicating logging exclusion zones in the annual work plan and evidence of implementation on the ground. Harvesting block location are clearly marked and can be verified on the ground. Forest permit holder has a valid work plan in compliance with applicable regulations. The location and extractable volumes of logs within the area to be established to timber estate are to correspond to the work plan. Permit holders ensure that all logs transported from a log yard in the forest to a primary forest products industry or registered log trader, including via an intermediate log yard are physically identified and accompanied by valid documents. All logs which have been harvested or commercially extracted are reported in the Timber Production Report. All logs transported out of the permit area are accompanied by a legal transport document. Legal transport documents and relevant attachments from the Log Yard to the Intermediate Log Yard and from Intermediate Log Yard to primary industry and/or registered log trader. Timber administration marks/barcode (PUHH) on logs. Permit holder applies timber marking consistently. Permit holder can show the existence of log transport documents accompanying logs transported from log yard. Log Transport Document to which is attached a log list document. Permit holders show proof of payment of Forest Resources Fee which corresponds to the log production and the applicable tariff. Payment of the Forest Resources Fee is consistent with log production and the applicable tariff. Permit holder has applicable environmental impact assessment documents approved by the competent authorities which cover the entire work area. Permit holder has environmental management and monitoring implementation reports taken to mitigate environmental impacts and provide social benefits. Legality of ownership or land title in relation to the timber harvesting area. Private land or forest owner can prove ownership or use rights of the land. Map of the area of private forest and boundaries delineated on the ground. Management units (either owned individually or by a group) demonstrate valid timber transportation documents. Management units show proof of payment of applicable charges related to trees present prior to the transfer of rights or tenure of the area. Proof of payment of Reforestation Fund and/or Forest Resources Fee and compensation to the state for the value of stumpage cut. The business groups are legally established. Land Cultivation Rights holder or private-forest owners has applicable EIA documents approved by the competent authorities which cover the entire work area. Timber harvesting permit within non-forest zone without altering the legal status of the forest. Maps attached to the ILS/IPK permits of the lease area and evidence of compliance on the ground. Note: This also applies for area previously categorised as Reforestation-based Plantation Forest (HTHR). Business permit and maps attached to the permit (including applicable environmental impact assessment/EIA document of non forestry business). Timber harvesting permit within non-forest zone. Timber harvesting authorised under a land conversion permit (IPK) within non-forest zone. IPK/ILS plan and implementation complies with land use planning. Business units support the realisation of legal trade in timber. Availability of Raw Materials Stock Planning (RPBBI) for primary industry. Exporters of processed timber products have valid permits as both producers and exporters of timber products. The exporters have the status of Registered Exporters of Forestry Industry Products (ETPIK). The importers have the status of Registered Importers. The importers have the due diligence guidelines/procedures and proof of its implementation. Permit document from Head of Provincial/District Forestry office. Non-producer registered-exporters have valid permits. Permit to engage in trading business (Business Licence/SIUP) or trading permit. Registration of the traders as Non-Producer Exporters of Forestry Industry Products (ETPIK Non-Produsen). Note: Not applicable for non-producer registered-exporters. The business units in the form of groups or cooperatives are legally established. Existence and application of a system which traces timber. Business units can demonstrate that the timber received comes from legal sources. Sales and purchase documents and or contract of supply of materials and or proof of purchase. Imported timber is accompanied by Supplier's Declaration of Conformity or legality certificate (S-LK). Note: Only applicable in the case of artisan/household industry. Transport documents (Nota) with corresponding official reports from the officer of the local authority with respect to used timber from demolished buildings/structures, unearthed timber and buried timber. Documents/reports on changes in the stock of logs/timber/products. Importers have valid documents that proof the imported timber comes from legal sources. Note: Not applicable for artisan/household industry. Proof of payment of import duty. Note: Not applicable for depots and non-producer timber registered. Tally sheets on the use of raw materials and on production outputs. Output reports on the production of processed products. The production of the unit does not exceed the permitted production capacity. Segregation/separation of produced products from impounded timbers. Production process with another party (another industry or with artisans/household industries) provides for tracking of timber. Note: Not applicable for artisan/household industry, depots, and non-producer timber registered. Documentation of raw materials, production processes, and where applicable if export is conducted through service agreement with other company. Business units are able to demonstrate that the acquired products are from legal sources. Products are purchased from listed non-ETPIK industries partners that have legality certificate (S-LK) or SDoC (DKP). Documents/reports on changes in the stock of products. Legality of the trade or the change of ownership of timber. Trade or transfer of timber for domestic market accompanied with transport document. Shipping of processed timber for export complies with applicable legislation. Note: Not applicable for artisan/household industry and depots. Proof of payment of export duty, where applicable. Objective: To provide assurance that harvesting, transportation, processing and selling of round logs and processed timber products comply with all relevant Indonesian laws and regulations. Known for its pioneering role in combating illegal logging and the trade in illegally harvested timber and timber products, Indonesia hosted the East Asia Ministerial Conference on Forest Law Enforcement and Governance (FLEG) in Bali, in September 2001, which resulted in the Declaration on Forest Law Enforcement and Governance (Bali Declaration). Since then, Indonesia has continued to be at the forefront of international cooperation in combating illegal logging and associated trade. As part of international efforts to address these issues, a growing number of consumer countries have committed themselves to take measures to prevent trade in illegal timber on their markets, whilst producer countries have committed themselves to provide a mechanism assuring the legality of their timber products. It is important to establish a credible system to guarantee the legality of harvesting, transportation, processing and trade of timber and processed timber products. The Indonesian Timber Legality Assurance System (TLAS) provides assurance that timber and timber products produced and processed in Indonesia come from legal sources and are in full compliance with relevant Indonesian laws and regulations, as verified by independent auditing and monitored by civil society. The Indonesian regulation on the “Standards and Guidelines on the Assessment of Performance of Sustainable Forest Management and the Verification of Timber Legality in the State and Privately-owned Forests” (Forestry Minister's Regulation P.38/Menhut-II/2009) establish the TLAS. The TLAS also includes the Indonesian sustainability scheme and targets to improve forest governance, to suppress illegal logging and the associated timber trade to ensure credibility and to improve the image of Indonesia's timber products. TLAS is the basic system used to assure the legality of timber and timber products produced in Indonesia for export to the Union and to other markets. Since 2003, a wide range of Indonesian forestry stakeholders have been actively engaged in developing, implementing and evaluating the TLAS, thereby providing better oversight, transparency and credibility in the process. In 2009, the multi-stakeholder process resulted in the issuance of Forestry Minister's Regulation P.38/Menhut-II/2009, followed by DG Forest Utilization Technical Guidelines No 6/VI-SET/2009 and No 02/VI-BPPHH/2010, which were revised by Forestry Minister's Regulation P.68/Menhut-II/2011, P.45/Menhut-II/2012, P.42/Menhut-II/2013, DG Forest Utilization Technical Guidelines P.8/VI-SET/2011 and P.8/VI-BPPHH/2012. Based on lessons learned from initial TLAS implementation, the results of the joint assessment in accordance to Annex VIII of this Agreement, and recommendations from various stakeholders, the regulations were again revised through a multi-stakeholder process to become Forestry Minister's Regulation P.43/Menhut-II/2014 in June 2014 and P.95/Menhut-II/2014 in December 2014, followed by DG Forest Utilization Technical Guidelines No.P.14/VI-BPPHH/2014 in December 2014 and No.P.1/VI-BPPHH/2015 in January 2015 (hereinafter referred to as the TLAS Guidelines). The process of engagement with all stakeholders will be continued during implementation of the TLAS. Indonesian production forest resources can broadly be divided into two types of ownership: state forests and privately owned forests/lands. State forests consist of production forests for long-term sustainable timber production under a variety of permit types and forest areas that can be converted for non-forestry purposes such as for settlement or agricultural plantations. The application of TLAS on state forests and privately owned forests/lands is set out in Annex II. The TLAS covers timber and timber products from all permit types as well as the operations of all timber traders, downstream processors, exporters and importers. The TLAS covers timber products destined for domestic and international markets. All Indonesian producers, processors, and traders will be verified for legality, including those supplying the domestic market. The TLAS requires that imported timber and timber products are cleared at customs and comply with Indonesia's import regulations. These regulations require that imported timber and timber products must be accompanied by documents and other pieces of evidence providing assurance of the legality of the timber in its country of harvest. All timber and timber products imported into Indonesia must be included in a supply chain whose controls comply fully with all relevant Indonesian regulations. Certain timber products may contain recycled materials. Specific legality requirements for recycled timber are described in the legality standards and TLAS Guidelines. Impounded timber may be sold for use exclusively on the domestic market, with the exception of impounded timber that was harvested in conservation forest, which must be destroyed. Any industry receiving impounded timber must implement measures to segregate that timber from other supplies and duly inform a conformity assessment body (CAB), which will promptly conduct a special audit to ensure that this timber does not enter the export supply chain. No impounded timber may be covered by an export licence. Changes in the procedures for utilization and/or administration of timber from Customary Forests, to address implementation of Constitutional Court Decision (MK) No 35/PUU-X/2012, shall be introduced after the adoption of related implementing legislation. Timber and timber products in transit are strictly kept outside the gazetted Principal Customs Areas (PCA). Thus, such transit timber does not enter the PCA and furthermore will not be included in the timber supply chains of Indonesia. No transit timber will be issued with an export licence. The TLAS is based on specific timber legality standards covering all types of timber sources (permits and operators) and all operators' activities. These standards and their verification guidelines are set out in Annex II. The TLAS also incorporates the “Standard and Guidelines on Assessment of Performance in Sustainable Forest Management (SFM)”. The assessment of sustainable forest management using the SFM standard also verifies that the auditee complies with the relevant legality criteria of the TLAS. Permit holders operating within production forest zones on state-owned lands (permanent forest domain) must adhere to both relevant legality and SFM standards. They can opt for complying with the legality standard at first, but they must comply with both the legality standards and the sustainable forest management standards not later than the date when their initial legality certification expires. The permit holder (in the case of concessions) or landowner (in the case of private land) or company (in the case of traders, processors and exporters) shall demonstrate that every node of their supply chain is controlled and documented as set out in the Minister for Forestry Regulations P.30/Menhut-II/2012, P.41/Menhut-II/2014 and P.42/Menhut-II/2014 (hereinafter referred to as the Regulations). These Regulations require provincial and district forestry officials to undertake field verification and validate the documents which are submitted by permit holders, landowners, or processors at each node of the supply chain. The key documents for operational controls at each point in the supply chain are summarised in Diagram 1. All consignments in a supply chain must be accompanied by relevant transport documents indicating whether the material is covered by a valid SVLK certificate, or declared legal by use of Suppliers' Declaration of Conformity (SDoC), or originates from impounded sources. The owner or custodian of any consignment of timber or timber products at each point in a supply chain must record whether that consignment is SVLK certified, declared legal by use of Suppliers' Declaration of Conformity, or from an impounded source. If a consignment includes any impounded timber, the owner or custodian of that consignment must apply an effective system to segregate timber or timber products from verified legal sources, from impounded timber or timber products, and maintain records that distinguish between these sources. Operators in the supply chain are required to keep complete records on received, stored, processed and delivered timber and timber products. These records must be sufficient to enable subsequent reconciliation of quantitative data between and within nodes of the supply chain. Such data shall be made available for provincial and district forestry officials to carry out reconciliation. Main activities and procedures, including reconciliation, for each stage of the supply chain and the role of the CABs in assessing the integrity of the supply chain, are further explained in the Appendix of this Annex. The Indonesian TLAS is based on an approach known as “operator-based licensing” which has much in common with product or forest management certification systems. The Indonesian Ministry of Forestry nominates a number of conformity assessment bodies (Lembaga Penilai/LP and Lembaga Verifikasi/LV) which it authorizes to audit the legality of operations of timber producers, traders, processors, and exporters (“operators”). The conformity assessment bodies (CAB) are accredited by the Indonesian National Accreditation Body (KAN). CABs are contracted by operators who want their operations to be certified as legal. CABs are required to operate according to the ISO/IEC 17065 guideline. They report the outcome of the audits to the auditee and to the Ministry of Forestry. Summaries of reports are made publicly available. A CAB checks that the operator that is audited is operating in compliance with the Indonesian legality definition as contained in Annex II, including effective implementation of controls to prevent material from unknown sources entering its supply chains. When an auditee operating in state forests or a large industry (primary industry with a capacity above 6 000 m3/year, secondary industry with an investment above IDR 500 million) is found to be compliant, an SVLK legality certificate with a validity of 3 (three) years is issued. During this period, the CAB conducts annual surveillance visits to check that compliance is being maintained. For auditees operating small industries (primary industry with a capacity below 6 000 m3/year, secondary industry with an investment below IDR 500 million) the validity of the legality certificate is 6 (six) years, and 10 (ten) years for operators in privately owned forests/lands. In these cases CAB surveillance visits take place every second year (biennial). Operators in privately owned forests/lands, household industries, craftsmen/artisans, primary industry that exclusively processes timber from privately-owned forests/lands and cannot directly export, registered depots (trading timber or processed timber that is exclusively sourced from privately owned forests/lands or from SVLK certified operations under Perum Perhutani), and importers can use Suppliers' Declaration of Conformity to demonstrate the legality of their timber and timber products and are therefore not audited by the CABs (refer to section 5.3). LVs also act as export Licensing Authorities. They check the validity of the exporters' SVLK certificate and export registration, and the consistency of exporters' data declarations (monthly balance sheets) before issuing export licences in the form of V-Legal Documents or FLEGT licences. Thus exports of timber products covered by Annex I without an export licence are prohibited. Exports to the European Union that meet these conditions are issued with FLEGT licences, while exports to other destinations are issued with V-Legal Documents. The TLAS Guidelines specify that Indonesian civil society groups, individuals and communities have the right to monitor the implementation of the TLAS on the ground. 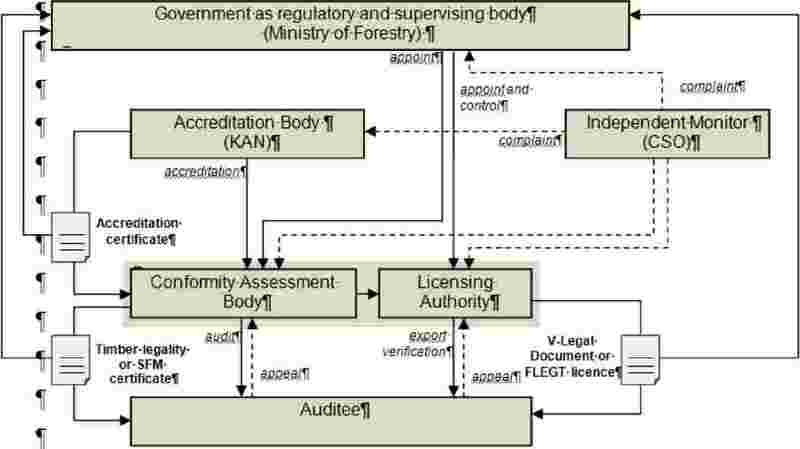 Such Independent Monitors are allowed to assess the compliance of operations against the requirements of the legality definition and also the conformity of the auditing and licensing processes against TLAS requirements and file complaints to CABs, Licensing Authorities, KAN and the Ministry of Forestry. The conformity assessment bodies (CABs) play a key role in the Indonesian system. They are authorized by the Ministry of Forestry and contracted by individual operators to verify the legality of the production, processing and trade activities of individual operators in the supply chain, including the integrity of the supply chain. There are two types of CABs: (i) assessment bodies (Lembaga Penilai/LP) which audit the performance of Forest Management Units (FMUs) in state forests against the sustainability standards as well as the requirements of the legality standard; and (ii) verification bodies (Lembaga Verifikasi/LV), which audit FMUs, forest-based industries, traders and exporters against the legality standards. In order to ensure that those audits that verify the legality standards as set out in Annex II are of the highest quality, the LP and LV are required to develop the necessary management systems addressing competency, consistency, impartiality, transparency, and assessment process requirements as outlined in ISO/IEC 17065. These requirements are specified in the TLAS Guidelines. The conformity assessment bodies (CAB) are accredited by the Indonesian National Accreditation Body (KAN). LVs can also act as Licensing Authorities. In this case the LVs issue export licences to cover timber products destined to international markets. For non-Union markets, the Licensing Authorities will issue V-Legal Documents, and for the Union market, FLEGT licences will be issued in accordance with the requirements as outlined in Annex IV. Detailed procedures for the V-Legal Document and FLEGT licensing of export consignments are described in the TLAS Guidelines. LPs cannot act as Licensing Authorities and do not issue export licences. All auditors working for CABs or Licensing Authorities must be registered and hold a valid certificate of competence from the Profession Certification Body (Lembaga Sertifikasi Profesi — LSP). The LSP will assess any alleged misconduct by an auditor brought to its notice, and may revoke the certificate of competence of that auditor. The Indonesian National Accreditation Body (Komite Akreditasi Nasional — KAN) is an independent accreditation body established through Government Regulation (Peraturan Pemerintah/PP) 102/2000 concerning National Standardisation and Presidential Decree (Keputusan Presiden/Keppres) 78/2001 regarding the National Accreditation Committee. It operates under the guidance of ISO/IEC 17011 (General Requirements for Accreditation Bodies Accrediting Conformity Assessment Bodies). It has developed internal TLAS-specific supporting documents for the accreditation of LPs and LVs. KAN is internationally recognised by the Pacific Accreditation Cooperation (PAC) and the International Accreditation Forum (IAF) to accredit certification bodies for Quality Management Systems, Environmental Management Systems and Product Certification. KAN is also recognised by the Asia Pacific Laboratory Accreditation Cooperation (APLAC) and the International Laboratory Accreditation Cooperation (ILAC). On 14 July 2009, the KAN signed a Memorandum of Understanding with the Ministry of Forestry to provide accreditation services for the TLAS. This makes it responsible for the accreditation of CABs to ensure their continued compliance with ISO/IEC 17065. Complaints concerning the performance of a LP or LV can be submitted by any interested party, including operators and independent monitors, to the KAN.
Auditees are operators which are subject to legality verification. They include forest management units (concessionaires or timber utilization permit holders, community-based or village based forest permit holders, private forest/land owners), registered timber depots, forest-based industries, non-producer registered exporters. The forest management units and forest-based industries must comply with the applicable legality standard. For export purposes, the forest-based industries and non-producer registered exporters must comply with export licensing requirements. The TLAS allows auditees to submit appeals to the LP or LV on the conduct of or results of audits. Civil society plays a key role in the Independent Monitoring (IM) of the TLAS. Civil society groups, individuals and communities acting as Independent Monitors have the right to assess and report on the compliance of operations against legality requirements, as well as on accreditation, verification and licensing activities. Findings from an Independent Monitor can also be used as part of the Periodic Evaluation (PE) which is required under this Agreement (Annex VI). In the event of an irregularity related to the legality of an operator, complaints by an Independent Monitor shall be submitted directly to the concerned LP or LV. If they consider the response to a complaint by the LP or LV to be unsatisfactory, an Independent Monitor may file a report to the KAN and to the government. In case of complaints about the issuance of export licences, the Independent Monitor may directly file complaints with the Licensing Authority or with the Ministry of Forestry. The Ministry of Forestry (as of October 2014, the Ministry of Forestry was merged with the Ministry of Environment to become the Ministry of Environment and Forestry) regulates the TLAS and authorises the accredited LPs to undertake SFM assessment and LVs to undertake legality verification. The Ministry of Forestry also authorises the LVs to issue export licences (V-Legal Documents or FLEGT licences). The Ministry of Forestry has issued a set of Guidelines providing the requirements related to verification and licensing activities. These Guidelines also include provisions for Ministry of Forestry's control over LVs verification, and specify the Ministry's procedures to authorize and oversee their licensing activities. Furthermore, the Ministry of Forestry shall establish an ad-hoc follow-up team in charge of investigating on a case-by-case basis any reported violation in relation to the issuance of a legality certificate and/or V-Legal Document/FLEGT licence. The composition of the follow-up team depends on the nature of the violation reported. It can comprise different government agencies and civil society actors. Based on the follow-up team findings and recommendations, the Ministry of Forestry may revoke the authorization of the CAB resulting in an immediate cessation of their verification and licensing activities. The Minister of Forestry will also immediately revoke their authorization of a CAB based on a KAN decision on withdrawal of its accreditation (e.g. resulting from KAN's annual surveillance activities of the CABs). CABs can appeal to KAN but not to the Ministry. The Ministry of Forestry also regulates the Licence Information Unit (LIU) as an information management unit which validates information concerning V-Legal Document/FLEGT licence issuance. The LIU is also responsible for general information exchange on the TLAS, and receives and stores relevant data and information on the issuance of certificates of legality and V-Legal Documents/FLEGT licences. It also responds to queries from competent authorities of trading partners and stakeholders. The LIU also manages the due diligence based import recommendation process through its SILK online system. In addition, the Ministry of Forestry controls the registration of technical governmental field supervisors (Wasganis) and technical company field staff (Ganis). Wasganis are tasked to carry out the supervision and control of log measurements. They also terminate the mandatory transport documents and carry out data reconciliation (for further details refer to the Appendix of this Annex). Ganis prepare the production and transport documents from all production in state forests. Ganis can also terminate the mandatory transport documents in the case of Wasganis' absence for more than 48 hours. Both Wasganis and Ganis are registered with the Ministry of Forestry. On a yearly basis, they are evaluated by the Ministry of Forestry through an official examination. Indonesian timber is deemed legal when its origin and production process as well as subsequent processing, transport and trade activities are verified as meeting all applicable Indonesian laws and regulations, as set out in Annex II. CABs carry out conformity assessments to verify compliance. To reduce the burden on private forest owners, as well as traders and household industries/craftsmen/artisans fully depending on timber from privately owned/privately utilized forests (private land permit), such operators are allowed in clearly described cases to issue a Supplier's Declaration of Conformity as an alternative to obtaining an SVLK certification (see paragraph 5.2 below for more detail). Application and contracting: The operator submits to the CAB an application that defines the scope of verification, operator's profile and other necessary information. A contract between the operator and the CAB, setting out the conditions for verification, is required prior to the commencement of the verification activities. Verification plan: After the signing of the verification contract, the CAB prepares a verification plan, which includes nomination of the audit team, verification programme and schedule of activities. The plan is communicated to the auditee, to the relevant Provincial Forestry Authority and other relevant authorities at provincial and regional levels, and the dates of verification activities are agreed upon. This information shall be made available in advance for the independent monitors and to the public through the websites of the CABs and the Ministry of Forestry, and/or mass media or letters. Verification activities: The verification audit consists of three stages: (i) opening audit meeting and coordination, (ii) document verification & field observation and (iii) closing audit meeting. Document verification and field observation stage: in order to collect evidence on the auditee's compliance with the Indonesian TLAS requirements, the CAB checks the auditee's systems and procedures, relevant documents and records. The CAB then carries out field checks to verify compliance, including cross-checking their findings with the findings of official inspection reports. The CAB also checks the auditee's timber traceability system to ensure that there is evidence that all timber entering the supply meets the legality requirements. Closing audit meeting: the verification results, in particular any non-compliances that may be detected, are presented to the auditee. The auditee may raise questions on the verification results and provide clarification on the evidence presented by the CAB. Reporting and decision making: The audit team draws up a verification report, following a structure provided by the Ministry of Forestry. The report, which includes a description of any findings of non-compliances and the decision on certification taken, is shared with the auditee within fourteen calendar days after the closing audit meeting and submitted by the CAB to the Ministry of Forestry. The audit team findings are used primarily to decide on the outcome of the verification audit by the CAB. The CAB takes the decision on whether to issue a legality certificate based on the verification report prepared by the audit team. In cases of any non-compliance, the CAB will refrain from issuing a legality certificate, which will prevent the timber from entering the supply chain of verified legal timber. Once the non-compliance has been addressed, the operator may resubmit a request for legality verification. Infringements, which are discovered by a CAB during the verification, are reported to the Ministry of Forestry and handled by the responsible authorities in accordance with administrative or judicial procedures. If an operator is suspected of breaching regulations, the national, provincial and district authorities may decide to halt the operator's activities. Issuance of the legality certificate and recertification: the CAB will issue a legality certificate if an auditee is found to fully comply with all the indicators and verifiers in the legality standard, including the rules on control of the timber supply chain. The CAB may report at any time to the Ministry of Forestry on issued, changed, suspended and withdrawn certificates and every three months shall issue a report. The Ministry of Forestry will then publish these reports on its website. According to the type of permit held by the auditee, a legality certificate is valid for a period of three to 10 years, after which the operator is subject to a re-certification audit. The re-certification shall be done prior to the expiry date of the certificate. Surveillance: According to the type of permit held by the auditee, operators with a legality certificate are subject to annual or biennial surveillance that follow the principles of the verification activities summarised above. The CAB may also carry out surveillance earlier than scheduled if the scope of the verification has been extended. The surveillance team draws up a surveillance report. A copy of the report, including a description of any non-compliance found, is submitted to the Ministry of Forestry. Non-compliances detected by the surveillance will result in suspension or withdrawal of the legality certificate. Special audits: Operators with a legality certificate are obliged to report to the CAB any significant changes in ownership, structures, management, and operations that may affect the quality of its legality controls during the period of validity of the certificate. The CAB may carry out special audits to investigate any complaints or disputes filed by the independent monitors, government institutions or other stakeholders or upon receipt of the operator's report on changes that affect the quality of its legality controls. CABs also carry out special audits if the operator reports that he intends to process impounded timber. Supplier's declaration of conformity based on SNI/ISO 17050 is a “self-declaration” as defined in ISO/IEC 17000, i.e. first-party attestation following review that fulfilment of specific requirements has been demonstrated. The SDoC can be used by (i) private forest owners, (ii) registered timber depots (only timber depots that exclusively receive timber from privately owned forests/lands or receive SVLK certified timber from Perum Perhutani), (iii) household industries/craftsmen/artisans, (iv) primary and secondary industries that exclusively process timber from privately owned forests/lands and hold no export permit. The SDoC applies to (a) timber from privately-owned forests/lands, (b) timber from regenerations of roadsides and graveyards, (c) recycled/demolished timber, and (d) imported timber or timber products. The SDoC contains information about the supplier, products and their sources, transport document, recipient of the products, and date of issuance. The SDoC by private forest owners shall also include a proof of ownership of the land the timber comes from. The SDoC is attached to the transport document based on timber administration regulations. Detailed procedures for SDoC issuance and related checks are provided in the TLAS Guidelines. The recipient of the SDoC from privately owned forest shall undertake and document internal checks on the validity of the information to be declared in the SDoC prior to signing of the purchase contract and at least once a year after the contract has been signed. Information contained in SDoCs issued by timber depots is checked by the recipient of the SDoC (primary or secondary industries) in intervals of three months for the traceability of log sources. This is verified by CABs when conducting an SVLK audit of the recipient through document review in case the recipient is certified. In addition, the Ministry of Forestry can carry out random inspections, which may be contracted to competent third parties. In indications of fraud and irregularities, the Ministry of Forestry can conduct special inspections of the operator which uses SDoC. All timber products covered by a V-Legal Document or FLEGT licence must come from a SVLK certified and or SDoC supply chain. Timber and timber products covered by SDoC cannot directly access international markets. Such access is only possible through a SVLK certified operator. Minister for Trade regulation 78/M-DAG/PER/10/2014 states that imported timber and timber products require proof of legality in the country of harvest. In this context, the SDoC template is also used for imports. Only registered importers (traders) and processing operators can import timber and/or timber products into Indonesia. These operators must exercise due diligence on imported timber and/or timber products to minimize the risk of illegal timber entering the Indonesian supply chain. They are required to provide information such as HS codes of products, Bill of Lading, countries of harvest, country of origin, proof of timber legality, and port of export in the declaration template. The due diligence procedures encompass data collection, risk analysis and risk mitigation. Procedures are carried out using the SILK online system of the Ministry of Forestry. The Ministry issues an import recommendation to the Ministry of Trade after assessing each due diligence process conducted by an operator. CABs when conducting audits of the importer carry out document review of the due diligence system applied. Detailed procedures for the due diligence system and related checks will be provided in the TLAS guidelines and related import regulations. The Ministry of Forestry, as well as provincial and district forestry offices are responsible for the control of timber supply chains and checking of related documents (e.g. annual work plans, log felling reports, log balance-sheet reports, transport documents, logs/raw material/processed products balance-sheet reports and production tally sheets). In the event of inconsistencies, forestry officials may withhold approval of the control documents resulting in a suspension of operations. Infringements detected by forestry officials or by independent monitors are communicated to the CAB, which upon verification may lead the CAB to suspend or withdraw the awarded legality certificate. Forestry officials may take appropriate follow-up action in accordance with the regulatory procedures. The Ministry of Forestry also receives copies of the verification reports and subsequent surveillance and special audit reports issued by the CABs. Infringements discovered by the CABs, by forestry officials or by independent monitors are communicated between the involved actors and handled in accordance with administrative and judicial procedures. If an operator is suspected of breaching regulations, the national, provincial and district authorities may decide to suspend or halt the operator's activities. CABs immediately revoke the legality certificates if the requirements of the legality standard are no longer met. The Ministry of Forestry shall establish an ad-hoc task force in charge of inquiring and investigating any reported violation in relation to the issuance of a legality certificate and/or V-Legal Document/FLEGT licence (follow up team) on a case-by-case basis. The Indonesian export licence for legal timber products is known as the “V-Legal Document”. This is an export licence that provides evidence that the timber products exported meet the requirements of the Indonesian legality standard as set out in Annex II and were sourced from a supply chain with adequate controls against the inflow of timber from sources not verified as legal. The V-Legal Document is issued by the LVs who act as Licensing Authorities (LA) and will be used as a FLEGT licence for shipments to the Union once the parties have agreed to start the FLEGT licensing scheme. The procedures for issuing FLEGT licences/V-Legal Documents are provided in the TLAS Guidelines. The Ministry of Forestry has established a Licence Information Unit to maintain an electronic database with copies of all V-Legal Documents/FLEGT licences and LA non-compliance reports. The Licence Information Unit will grant on-line access to its database to the competent authorities of the Union. In the event of an inquiry concerning the authenticity, completeness, and validity of a specific FLEGT licence, the competent authority in the Union will be able to verify the licence information by using the SILK on-line database. For further information, the competent authorities of the Union can contact the Licence Information Unit, which will communicate with the relevant LA if needed. The V-Legal Document/FLEGT licence is issued by the LA, which holds a contract with the exporter, for the consignment of timber products to be exported. The exporter's internal traceability system shall provide evidence on the legality of timber for export licensing. The previous stage of the supply chain shall be included in the exporter's internal traceability system. For a V-Legal Document/FLEGT licence to be issued, all suppliers in the exporter's supply chain that make up the consignment must have been covered by a valid legality or SFM certificate or a SDoC. Summaries of Timber/Raw Material Balance-Sheet Reports and Processed Timber Balance-Sheet Reports since the last audit (up to max 12 months). Verification of the validity of the operator's legality certificate and ETPIK registration, using LA's own database as well as SILK. Control of the recovery rate(s) for each type of product (primary industry only), based on analysis of the Timber/Raw Material Balance-Sheet Report and Processed Timber Balance-Sheet Report. Where necessary, a field visit may be conducted by the LA after data reconciliation so as to ensure consistency with the information to be specified in the V-Legal Document/FLEGT licence. This may be done through export consignments sample checking and inspecting the factory operation or timber depot, and record-keeping. An ETPIK holder meeting the above mentioned requirements may use conformity marking (V-Legal Label) on the products and/or packaging. National Guidelines on the use of conformity marking are described in the TLAS Guidelines. If an ETPIK holder does not comply with the legality and supply chain requirements, LA will issue a non-compliance report instead of V-Legal Document/FLEGT licence. The non-compliance report halts the movement of the related timber and/or timber products. In case a shipment changes configuration before leaving the port of export (e.g. change of destination, volume, species as defined in the TLAS Guidelines), the exporter must request the Licensing Authority to cancel the initial export license and issue new licence(s). The Licensing Authority must inform LIU of all cancelled export licences. In case of misuse or falsification of legality certificates and/or export licences by an operator, a sanction shall be imposed by the Ministry of Forestry as defined in applicable regulations. Submit a comprehensive report and a public summary report outlining the number of V-Legal Documents/FLEGT licence issued as well as the number and type of non-compliances detected to the Ministry of Forestry once every three months with copies to the Ministry of Trade and Ministry of Industry. The Indonesian TLAS includes civil society monitoring (Independent Monitoring). To make the system even more robust for a FLEGT-VPA, a Period Evaluation (PE) component is added. IM is carried out by civil society to assess compliance of the operators, LPs, LV, and LAs with the Indonesian TLAS requirements including accreditation standards and Guidelines. Civil society is defined in this context as Indonesian legal entities including NGOs, communities, and individual Indonesian citizens. The objective of PE is to provide independent assurance that the Indonesian TLAS is functioning as described, thereby enhancing the credibility of the FLEGT licences issued. PE makes use of the findings and recommendations of IM. Terms of Reference for PE are set out in Annex VI. 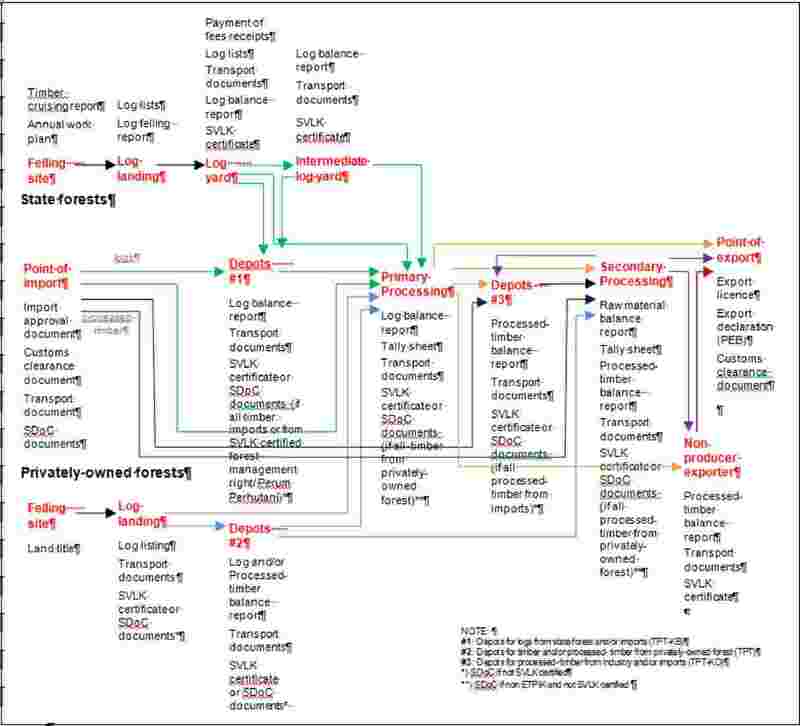 As described in Annex V, all along the different supply chains, operators' declarations and record keeping (e.g. transport documents and balance-sheet reports) must indicate whether timber or timber products are SVLK certified, declared legal by use of Suppliers' Declaration of Conformity (SDoC), or from an impounded source. Operational controls of the supply chain for state-owned forests (natural forests and plantation forests) are regulated by Minister for Forestry regulations P.41/Menhut-II/2014 and P.42/Menhut-II/2014 on timber administration. This includes Minister for Forestry regulation P.43/Menhut-II/2014 on SVLK standards, followed by DG Forest Utilization Technical guidelines P.14/VI-BPPHH/2014 and DG circulation letter SE 8/VI-BPPHH/2014 in August 2014. All procedures and rules for decision-making related to verification, data reconciliation and non-compliance management at each stage of the supply chain listed below apply to all kinds of forest permits granted on state-owned forests: natural forest concessions (IUPHHK-HA/HPH), industrial plantation forest concessions (IUPHHK-HT/HPHTI), ecosystem restoration concessions (IUPHHK-RE), management right for plantation forests (Perum Perhutani), community forest plantation concessions(IUPHHK-HTR) and community forest concessions (IUPHHK-HKM), village forest concessions (IUPHHK-HD), utilization of timber from reforestation area concessions (IUPHHK-HTHR)and utilization of timber from non-forest zones or convertible production forest (IPK).These procedures and rules are described in the technical guidelines provided in Minister for Forestry regulations P.41/Menhut-II/2014 and P.42/Menhut-II/2014 on timber administration. All operators holding a harvesting permit for timber from a natural forest concession must declare all their production data in the national online-tracking system at each stage of the supply chain from the forest concession until intermediate log-yard and primary industry. Note that an operator holding a valid SFM certificate issued under the SVLK can self-approve and issue his Annual Work Plan. Conformity of the Annual Work Plan is verified by the CAB when carrying out initial and surveillance audits. Harvesting operations by the permit holder, including skidding of logs to the log-landing site. The permit holder submits the Timber Cruising Report or the Timber Inventory Report to the district forestry official. The official conducts both a document-based and field verification of the Timber Cruising Report or the Timber Inventory Report on a sample basis. The official approves the Report if all declared data match field observations. During harvesting operations, tags are used to ensure that the log is from an approved felling site, as described above. For planted trees or trees harvested in plantation forest concessions (for pulp or chip purposes), tags are not required. Approval of the Log Production Report by the technical governmental field supervisor (Wasganis). The permit holder monthly submits the approved Log Production Reports and the related summaries to the district forestry office. The district forestry official checks the number of logs, the tags and the total cumulative volume of logs extracted and declared in the Log Production Report against the quota approved in the Annual Work Plan. Tags are not applied for IPK. The district forestry official checks the total cumulative volume of logs extracted and declared in the Log Production Report against the approved quota in the Annual Work Plan. The Log Production Reports are also checked by CABs during initial and surveillance audits. CABs also organize field inspections on an ad-hoc basis when needed as described in the TLAS Guidelines. In case of any inconsistencies detected, the district forestry official informs the CAB in charge of verifying the compliance of the operator, and vice-versa. Logs are transported from the log-landing site to log yards and then either directly transported to a processing mill, to an intermediate log-yard or to a registered timber depot. Preparation of a Log Balance-Sheet Report by the permit holder. The permit holder prepares/updates the Log Balance-Sheet Report to record the quantity of incoming, stored and outgoing logs at the log-yard. The permit holder monthly submits the Log Balance-Sheet Report to the district forestry office. The district forestry official checks the Log Balance-Sheet Report comparing inflows, outflows and storage of logs at the log-yard, based on Log Production Reports and relevant Log Transport Documents. When needed, the district forestry official also carries out field inspections to assess the consistency between stocked logs, the balance-sheet report and relevant transport documents. TheLog Balance-Sheet Report is also checked by CABs during initial and surveillance audits. CABs also organize field inspections on an ad-hoc basis when needed as described in the TLAS Guidelines. Intermediate log-yards are used if logs are not transported from the concession area directly to the mill yard. Intermediate log-yards are used in particular for inter-island transportation of logs or if the transport mode is changed. The permit for establishment of an intermediate log-yard located in state forests is granted by the district forestry official based on a proposal submitted by the permit holder. An intermediate log-yard permit is valid for three years, but can be extended following review and approval by the forestry official. The establishment of an intermediate log-yard located outside state forests does not require any specific permit and is determined by the permit holder. In case 48 hours are exceeded after the submission of Log Transport Document, termination of its validity can be done by the Ganis. The Ganis completes the Log Transport Document following the format provided by the Ministry of Forestry. In the case of 48 hours are exceeded after the Log Transport Document was submitted, this verification can be done by the Ganis. The district forestry official checks the Log Balance-Sheet report to assess the consistency between the logs transported from the log-yard and the logs entering the intermediate log-yard. When needed, the district forestry official also carries out field inspections to assess the consistency between stocked logs, the balance-sheet report and relevant transport documents. The Log Balance-Sheet report is also checked by CABs during initial and surveillance audits. CABs also organize field inspections on an ad-hoc basis when needed as described in the TLAS Guidelines. Timber harvesting operations on privately-owned forests/lands are regulated by Minister of Forestry Regulation P.30/Menhut-II/2012 (hereinafter referred to as the Regulation). There are no legal requirements for the private owners of forests/lands to affix ID tags or marks on trees inventoried for harvesting. Log-yards and intermediate log-yards are generally not used for timber harvested from privately-owned forests/lands. Control procedures for timber from privately-owned forests/lands differ between logs obtained from trees which were on the site when the land title was acquired and logs obtained from trees that have been established since the title was acquired. They also depend on the tree species harvested. The payment of the Forest Resources Fee, to the Reforestation Fund and stumpage fee apply to logs from trees already present on the site when the land title was awarded but does not apply to logs from trees established after the award of the land title. for species listed in Article 5(1) of the Regulation (such as Rubber, Sengon, and fruit trees), the owner prepares an invoice, following the format provided by the Ministry of Forestry which serves as the Transport document. for other species (such as Teak, Mahogany, Pine), the trained and appointed head of the village or appointed official issues the Transport document. In the case of logs harvested from trees present on a site before the granting of the land title, the district forestry official issues the Transport document. Such timber needs to be SVLK certified. Issuance or preparation of the transport document. Issuance or preparation of the Supplier's Declaration of Conformity (SDoC), unless the operator is engaged into SVLK certification. Based on the above, the district forestry official issues the Log Transport Document. Based on the above, the owner prepares an invoice following the format provided by the Ministry of Forestry, which also serves as the transport document. Based on the above, the head of village or appointed official issues the Log Transport Document following the format provided by the Ministry of Forestry. For all timber harvested from planted trees, if not SVLK certified, the owner issues an SDoC using the format provided by the Ministry of Forestry. The head of village or an official appointed by the district forestry official, or the district forestry official (in case of timber from naturally grown trees) compares the volume of harvested logs with the log-list. In case the operator engaged into SVLK certification, the CAB also checks the consistency between the volume of harvested logs with the log-list during initial and surveillance audits. The CAB also organizes field inspections on an ad-hoc basis when needed. In case of any inconsistencies detected, the head of village or appointed official or the district forestry official (in case of timber from naturally grown trees) informs the CAB in charge of verifying the operator's compliance and vice-versa. Registered Timber and Processed-Timber Depots represent specific actors within the supply chain. Acting as traders, these operators buy, stock and sell timber and timber products to other operators without being involved in producing or processing activities. Depots using exclusively processed-timber originating from state forests and/or imports (TPT-KO). Registered Timber Depots for timber from State forests and imported timber (TPT-KB) are used if logs are not transported directly to the mill yard, from the concession area and/or intermediate log-yards and/or other TPT-KB or in the case of imported timber(logs). The permit for the establishment of a TPT-KB is granted by the forestry official based on a proposal submitted by the permit holder. A TPT-KB permit is valid for three years, but can be extended following review and approval by the forestry official. TPT-KB operators can use SDoC only if they use exclusively imported timber and/or SVLK certified Perum Perhutani timber. If only one of their timber sources contains timber from state forests (except the certified Perum Perhutani timber), they must be SVLK certified. The Wasganis terminates the validity of the Log Transport Document for the incoming logs. Subject to a positive outcome of the verification, the permit holder records the timber in the Log Balance-Sheet Report. The Log Transport Document for outgoing logs is completed by the permit holder or Ganis. If not SVLK certified and using exclusively imported timber and/or certified Perum Perhutani timber, the permit holder issues an SDoC using the format provided by the Ministry of Forestry. The district forestry official checks the Log Balance-Sheet Report and the consistency between the logs transported from the log-yard or the intermediate log-yard and the logs entering into the registered timber depot by comparing the log transport document and the log list of incoming logs. The district forestry official carries out field inspections when needed. In case the permit holder engaged into SVLK certification, the Log Balance-Sheet report is also checked by the CAB during initial and surveillance audits. The CAB also organizes field inspections on an ad-hoc basis when needed as described in the TLAS Guidelines. In case of any inconsistencies detected, the district forestry official informs the CAB in charge of verifying the operator's compliance and vice-versa. Registered Timber and/or Processed-timber Depots for timber from Privately-owned forests/lands(TPTs) are used if logs and/or processed-timber are not transported directly to the mill yard, from privately-owned forests/lands and/or other TPT. The permit for the establishment of a TPT is granted by the forestry official based on a proposal submitted by the permit holder. A TPT permit is reviewed and approved by the forestry official. Operators running TPTs can use SDoC only if they are not engaged into SVLK certification. Operators running TPTs must use exclusively timber and/or processed timber from planted trees of privately-owned forests/lands. The permit holder completes the Log and/or Processed-timber Transport Document. The permit holder monthly submits the Log and/or Processed-timber Balance-Sheet Report to the district forestry office. The district forestry official checks the Log and/or Processed-timber Balance-Sheet Reports and the consistency between the logs and/or processed-timber transported from the privately-owned forests or other TPTs and the logs and/or processed-timber entering the TPT by comparing the Log and/or Processed-timber Transport Document and the log-list and/or processed-timber list of incoming logs and/or processed-timber. The district forestry official carries out field inspections when needed. If the permit holder is engaged into SVLK certification, the Log and/or Processed-timber Balance-Sheet Reports are also checked by CABs during initial and surveillance audits. CABs also organize field inspections on an ad-hoc basis when needed as described in the TLAS Guidelines. Issuance or preparation of the SDoC (in case of the operator uses exclusively timber originating from privately owned forests/lands and not engaged into SVLK certification). In case the operator uses an official online log tracking system, the Log Transport Documents are terminated by the registered technical staff. The permit holder monthly submits the Log Balance-Sheet Report and the Processed-timber Balance-Sheet Report to the forestry office. The forestry official checks the Log Balance-Sheet and Processed-timber Balance-Sheet Reports comparing inflows, outflows and storage of logs based on Log Transport Documents. The Production Tally Sheet is used to reconcile input and output volume of production lines and the recovery rate is compared with the published average rate. If the permit holder is engaged into SVLK certification, the Log Balance-Sheet and Processed-Timber Balance-Sheet Reports are also checked by the CAB during initial and surveillance audits. The CAB also organizes field inspections on an ad-hoc basis when needed as described in the TLAS Guidelines. In case of any inconsistencies detected, the forestry official informs the CAB in charge of verifying the operator's compliance and vice-versa. Registered Processed-timber Depots for timber originating from State Forests and/or Imports (TPT-KOs) are processed-timber depots that receive processed-timber from primary processing units, and/or from other TPT-KOs, and/or imported processed-timber. Timber products from TPT-KOs are sold to secondary processing units, other TPT-KOs, household industries, registered exporters, and/or end users. The permit for establishment of a TPT-KO is granted by the district forestry official based on a proposal submitted by the permit holder. A permit for TPT-KO is valid for three years, but can be extended following review and approval by the district forestry official. TPT-KO operators can use SDoC only if they use exclusively timber products originating from imported processed-timber. If only one of their processed-timber products contains processed-timber originating from natural forests, they must be SVLK certified. Issuance or preparation of the SDoC (in case of processed-timber exclusively from imported timber and operator not engaged into SVLK certification). The Ganis terminates the validity of the Timber Products Transport Documents for the incoming processed-timber. If not SVLK certified and using exclusively imported processed-timber, the permit holder issues an SDoC using the format provided by the Ministry of Forestry. The permit holder updates the Processed-Timber Balance-Sheet Report, which records inflows, outflows and storage of timber products at the Registered Processed-timber Depots, based on the relevant Timber Products Transport Documents and import documents. The Ganis checks the Processed-Timber Balance-Sheet Report and the consistency between the incoming processed-timber and related Timber Products Transport Documents and import documents. The district forestry official carries out field inspections when needed. In case the permit holder is engaged into SVLK certification, the Processed-Timber Balance-Sheet Report is also checked by the CAB during initial and surveillance audits. The CAB organizes field inspections on an ad-hoc basis when needed as described in the TLAS Guidelines. If using exclusively processed-timber originating from privately owned-forests/lands and not engaged into SVLK certification, the non ETPIK permit holder issues an SDoC using the format provided by the Ministry of Forestry. The factory operator checks the Processed Timber Balance-Sheet Report comparing inflows, outflows and storage of materials based on Processed Timber Transport Documents and Processed Timber Tally Sheet. The Production Tally Sheet is used to check input and output volume of production lines and the recovery rate is evaluated. The company operator checks the Processed Timber Balance-Sheet Report, comparing inflows, outflows and storage of products based on invoices. The forestry official carries out field inspections when needed. In case the permit holder engaged into SVLK certification, the Processed Timber Balance-Sheet Report is also checked by the CAB during initial and surveillance audits. The CAB organizes field inspections on an ad-hoc basis when needed as described in the TLAS Guidelines. In case of any inconsistencies detected, the forestry official informs the CAB in charge of verifying operator's compliance and vice-versa. The procedures and data reconciliation processes for export of timber originating from state-owned forests and privately-owned forest/lands are identical. The Customs issues an Export Approval Document for Customs clearance. Subject to a positive outcome of the verification of the Export Declaration Document, Customs issue an Export Approval Document. The CAB and the LA check the consistency of inflows, outflows and storage based on the Processed-timber Balance Sheet Report. The CAB also cross-checks these data with the volume given in the invoice during initial and surveillance audits. The CAB organizes field inspections and the LA organizes physical verification of data consistency on an ad-hoc basis when needed as described in the TLAS Guidelines. (1) Indicates main regulations, which also covers subsequent amendments.